Another Brother tells the story of the life of Clarence Fitch (1948-1990), a Black Vietnam veteran, from his childhood in Jersey City to the Vietnam War and back. Featuring interviews with friends, family members and fellow veterans, as well as archival footage, it honors Fitch and tells the story of an ordinary hero whose life had a larger significance. Fitch’s story is very common. He volunteered for the United States Marine Corps in 1966, a month after finishing high school. Fitch was sent to Camp Pendleton (CA) for training and on to Vietnam. Greg Payton, a friend of Fitch’s, states that of his peer group, fourteen young men went into the military. Of that group, eleven were drafted, seven went to Nam, but only four returned alive. Clarence Fitch was one of them. 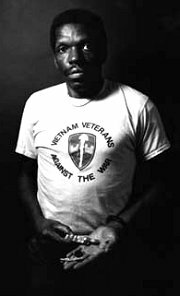 In Nam he began to develop a social consciousness about war, racism, violence, and the struggle for justice. What he saw at home while on leave from the Marines – riots, poverty, injustice, and police and National Guard violence – spurred him on to ask more questions about American society. Like many others, Fitch came back to the States with a less than honorable ("General") discharge and a drug problem. Despite these challenges, Fitch managed to function at home and work. He held a job at the U.S. Postal Service’s huge bulk mail facility in northern New Jersey. In the mid-1980s Fitch finally overcame addition, but it came two late. Fitch had contracted the HIV virus and died of AIDS after being clean for five years. Throughout this period of personal struggle, Fitch was active in community justice and social struggles. Fitch was active in the American Postal Workers Union, where for several years he served as a shop steward. He became active in the Vietnam Veterans Against the War and visited Panama and Nicaragua in the late 1980s. Fitch’s activism continued to the very end. In the last few months of his life, Fitch helped lead a successful campaign against bringing the Junior Reserve Officer Training Corps program into New York City’s Martin Luther King, Jr. High School. Another Brother is a powerful and moving documentary.